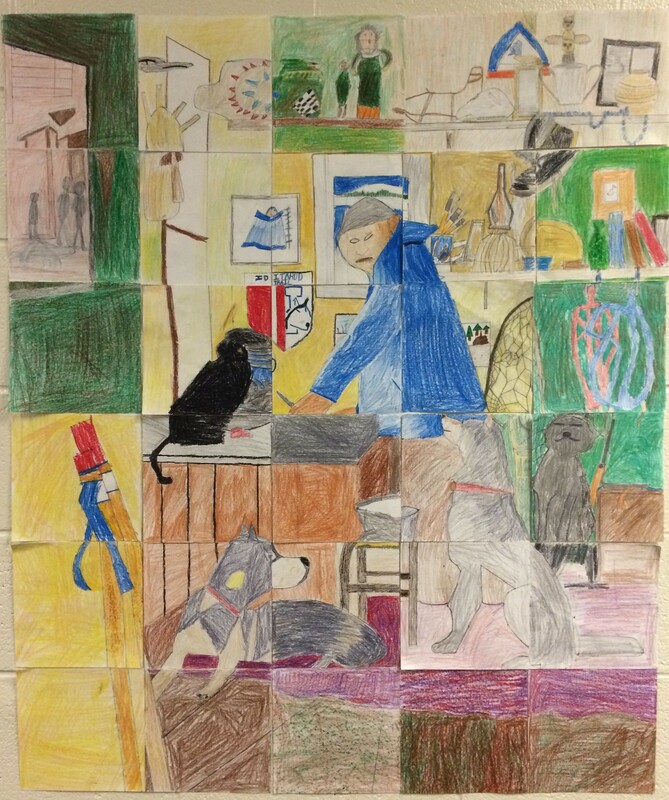 To summarize our experiences, we decided to create our own quilt square to be added to a new Iditarod Travelling Quilt. First, each boy designed his own square. They included symbols, words, and pictures that showed what they thought the “message” behind the race is. We also talked about the idea that our final quilt square would need to give information about where the square came from. After we assembled our quilt, we spent some time looking at it and looking for similarities between the squares. We figured if something appeared on many squares that must mean it’s important to us and should probably appear on our final square. We came up with a game plan of what we wanted our final square to be. 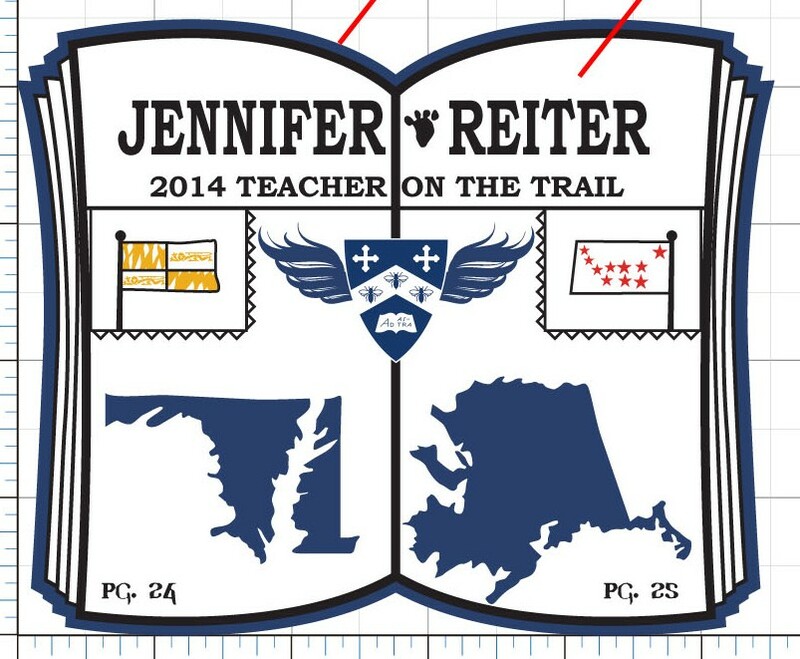 We decided to divide it into two sections – one for Alaska and one for Maryland. Each side features a map of the state colored like the state’s flag and is surrounded by symbols of things that the state is known. For Maryland there is afootball to represent the Ravens, a baseball for the Orioles, a lacrosse stick to show our state team sport, and a steamed crab. The Alaska side shows a gold pan, mail for the mail trail, a dog, and cross country skies. Then there is a dog sled running the Iditarod across the bottom and horses running the Preakness across the top. The center features the quote that the boy think best represents the race: “Dream. Try. Win.” ~ John Baker. I once joked with a coworker that I could turn anything into an Iditarod related lesson, and today I found another example! I had a chance to visit the Anchorage Museum, which is one of my favorite museums. They have an amazing exhibit on the history of Alaska, a fantastic kids area, and the beautiful Smithsonian Arctic Studies gallery of Native Alaskan culture and artifacts. They also have an area where they host changing exhibits. This is, of course, a problem for marine life who often misinterpret the waste as food or are caught up in the plastics especially. The Gyre expedition and exhibition is the result of a team of scientists and artists who explored the coastlines of Alaska and collected plastics most likely deposited from the North Pacific Gyre. The exhibit was a sobering reminder of what we are doing to our planet. The artists who were included in the exhibit took different approaches to the project. Some displayed found objects as they were, which was sobering. Some made juxtapositions between the ugly trash and the beauty of the environment in which they were found. And still others used the found materials to make something new. Like this dog sled and team! Wouldn’t this make a neat art project? Could you and your class create a life sized dog team from recycled materials? And there’s a perfect tie in between plastics in our oceans and the Iditarod! I decided a long time ago, that this was going to be a wonderful way to get my school involved in my adventure, and I approached my student council to see if they would be willing to help me out with this project. They readily agreed and decided that the best thing they could do would be to have a school wide contest to design the patch. 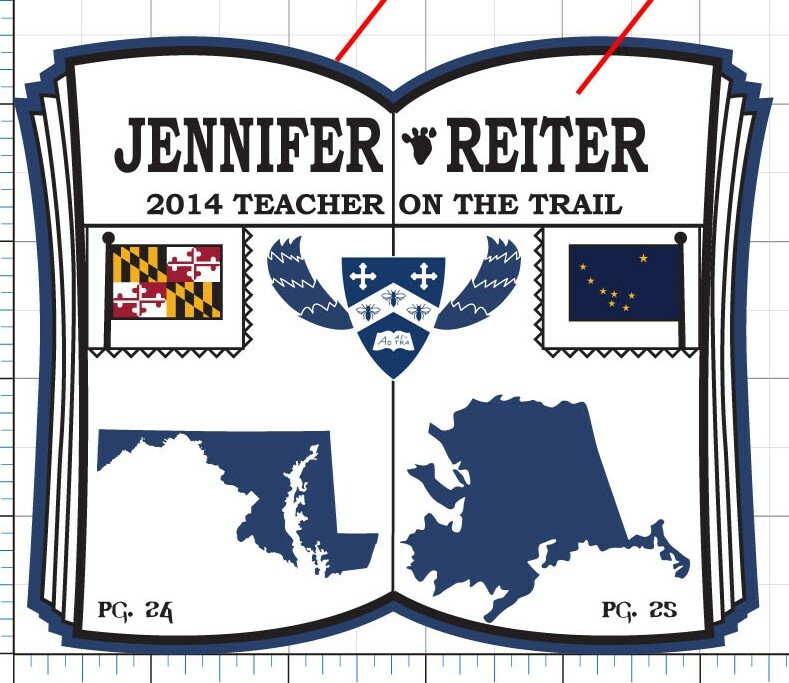 I explained that the patch needed to reflect my theme for the year, “Tales (and Tails) from the Trail” and that it should represent our school and show that we are located in Maryland. The contest was announced and the boys ended up with over fifty designs to judge and choose from. I think it represents my adventure perfectly! The open book is for the tales I will collect from the trail. 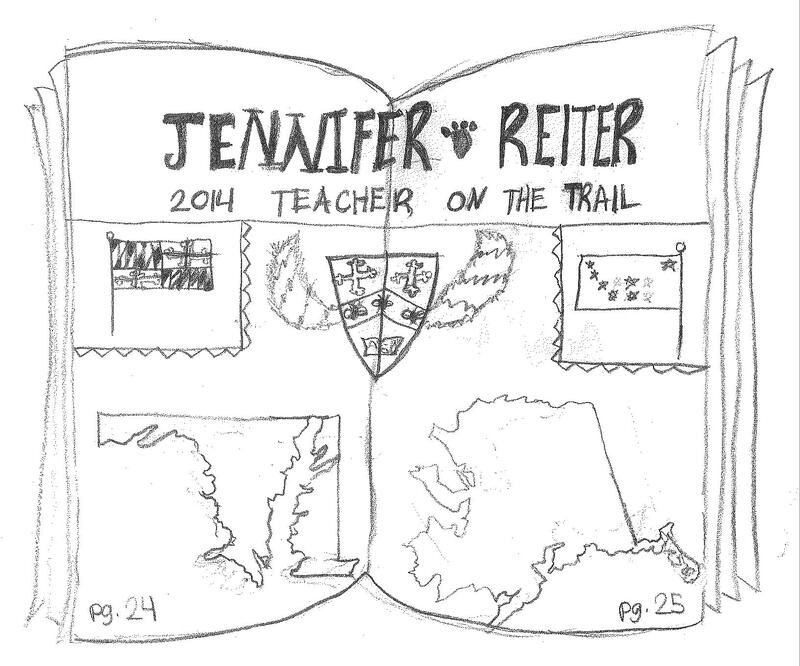 The left hand page shows the map and flag of my home state, Maryland. The right hand page shows the map and flag of Alaska. The crest in the middle is my school’s crest, and the two tails coming from its sides are the “tails” part of the motto. 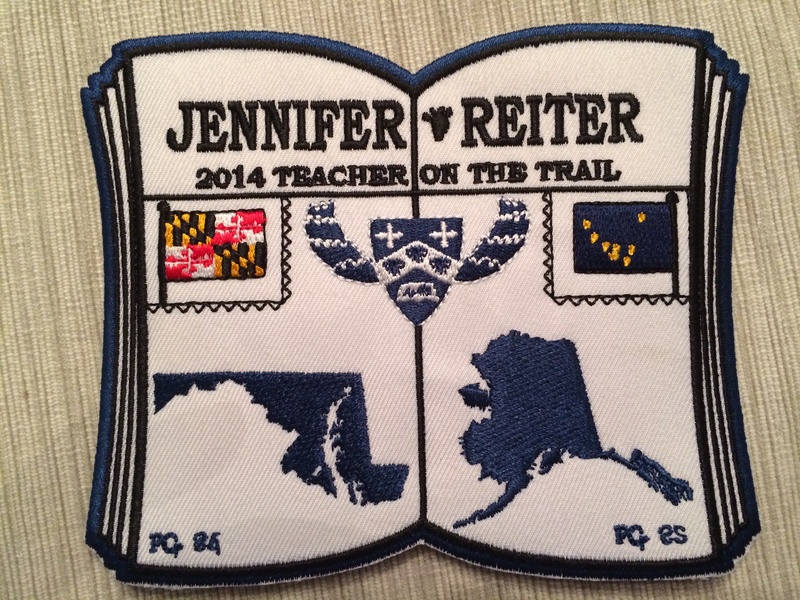 I stitched it onto the sleeping bag today, and it will now and forever be a part of Iditarod Teacher on the Trail™ history! The students of 3A have a seat at the table at the Mushers’ Banquet! Actually they have a seat ON the table…. Okay, actually, their artwork has a seat on the tables! We have shipped our centerpieces to Alaska! Every year, the Iditarod Education Department hosts a contest for school kids to design centerpieces for the Mushers’ Banquet. The banquet is held in Anchorage on the Thursday night before the race start. The main event of the banquet is the drawing that determines the starting order for the race. The banquet is held in the convention center and upon entering, seems like a sea of round banquet tables! Each table features several unique, original, and completely kid made centerpieces! It’s such a treat to watch the mushers , fans, and guests carefully examine each creation and ooh and ahh over each! To create our Northern Lights backgrounds, the boys used a very wet watercolor application to a 4×6 watercolor postcard. Before the paint dried, they quickly sprinkled Kosher salt over the paint and then let the watercolors dry. Once everything was super dry, we brushed the salt off and were left with some really neat textures. Then we used permanent Staz-On ink pads in black to stamp the sled dogs and in silver to stamp snowflakes on. We mounted the artwork on a slightly larger piece of scrapbooking paper and added an easel to the back.